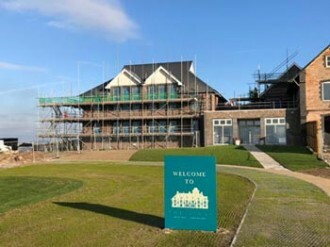 The Links, Rest Bay – marketing suite now open! RPA are proud to be involved in the continued restoration of The Rest in Porthcawl. Dating back nearly 150 years, this iconic Victorian Grade II listed building is steeped in history and we are delighted to be involved in its redevelopment as a collection of luxury apartments renamed The Links. The developer, Acorn Property Group, have taken on the development and restoration of the former purpose-built convalescent hotel, which is situated in an enviable location, overlooking the picturesque Rest Bay in Porthcawl. RPA are working closely with Acorn and Intelle Construction to deliver the scheme with the marketing suite having recently opened and sales for the first two blocks already being taken. As with any restoration project, the juxtaposition between old and new poses many challenges, but with collaborative working methods playing a key part at the heart of the project, the development is progressing well with completion of the first phase due in the summer of 2019.